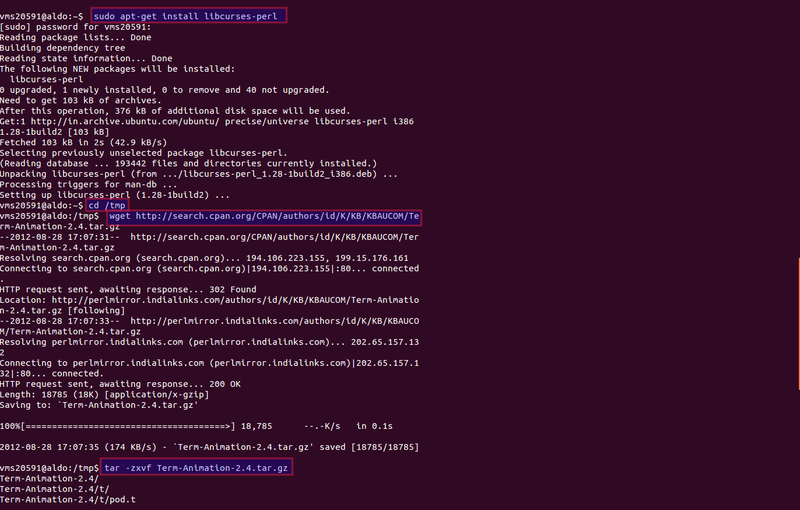 Users of command line interface always look out for something new to work with which makes them get excited. 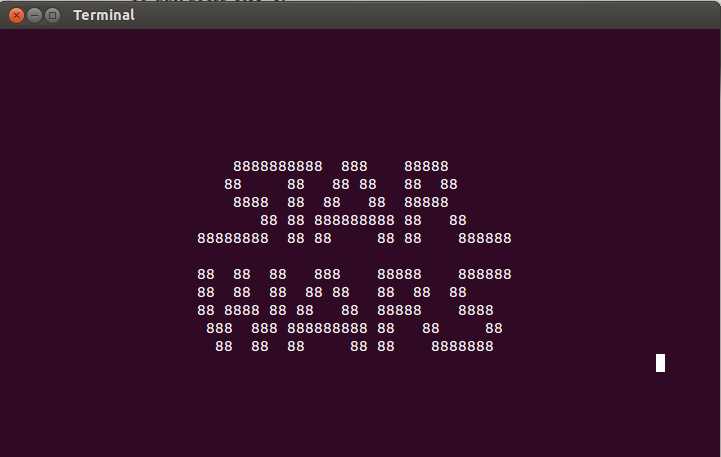 You might have seen some ASCII arts being used in info files of software and wondering how they did it. 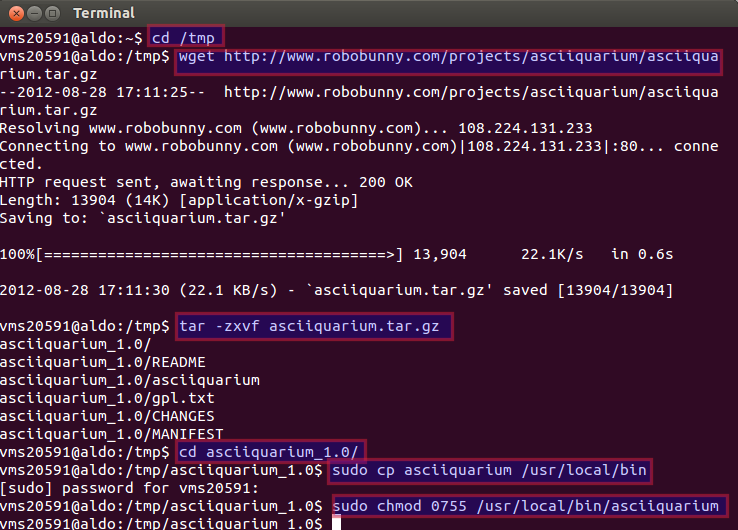 Well here we have added a collection of commands with which you can enjoy and have fun in the terminal while you are bored of slow downloads and lazy installations. 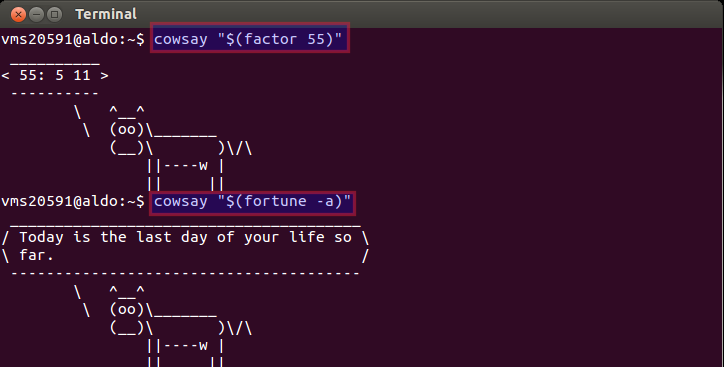 With these commands you have check out your daily fortune, see calender in terminal, etc. 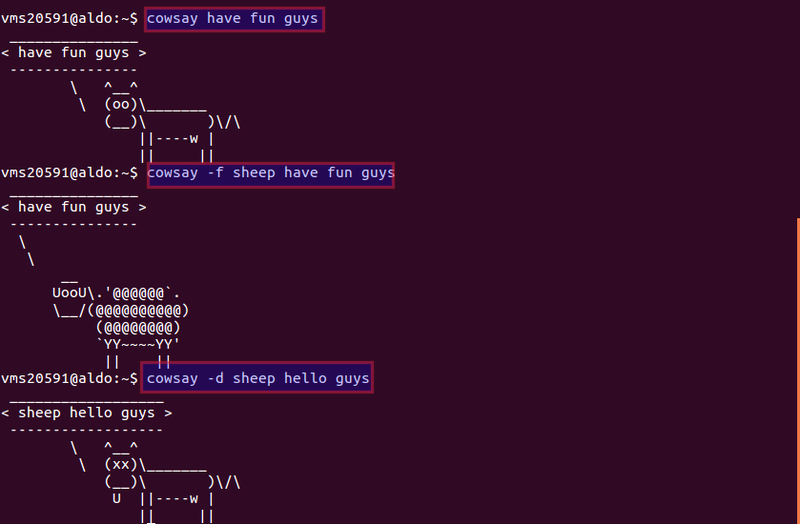 Cowsay is a fun command with which your input text is displayed by a cow (ASCII art generated) or any other animal of your wish. 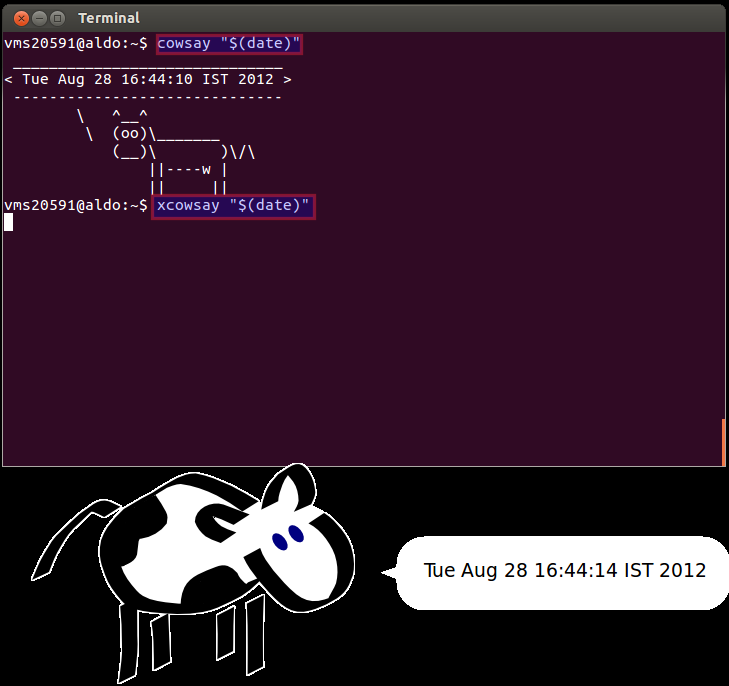 xcowsay is a command with which your input text is displayed by a graphical cow. This command displays a cat(Tom) which will hunt your mouse pointer (Jerry) all over the screen. 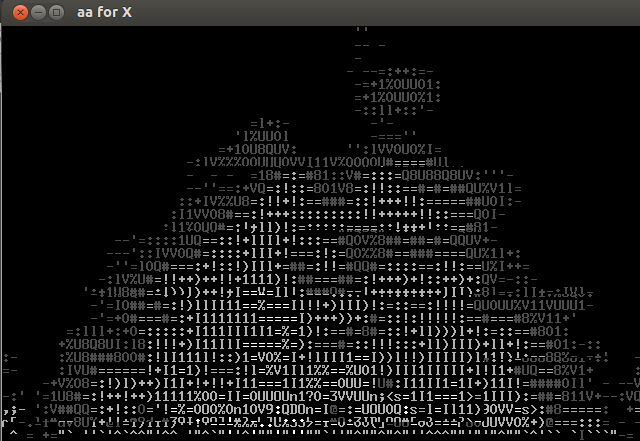 Ever wanted to see how star wars will be when it was made using ASCII art??? 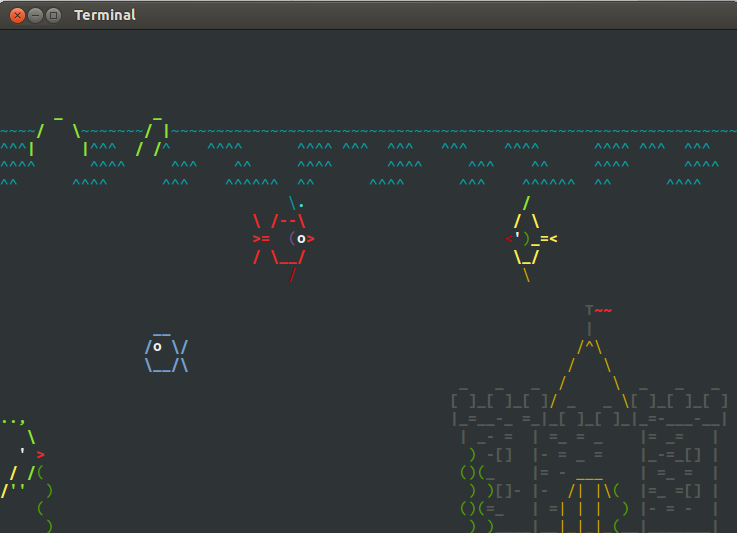 View a ASCII generated aquarium in your terminal. To enable music press y else press n.
Press 8 to continue or press displayed nos to enable or disable the option. Everyone knew about ls which is obviously used to display contents of folder. When you mistyped as sl , what will be the result, ever wondered?? 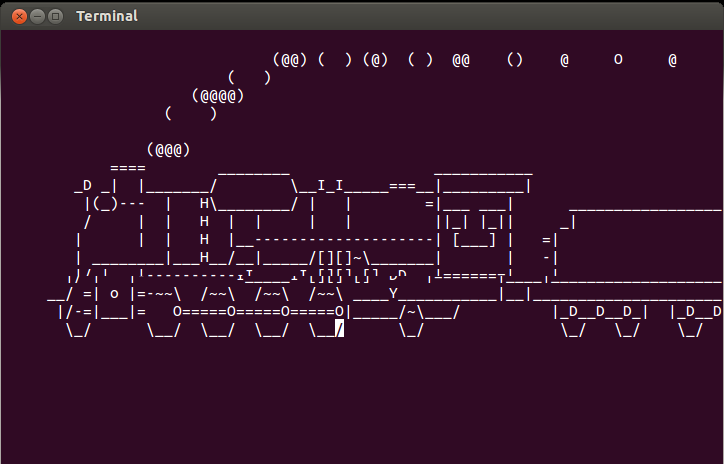 sl basically generates a ASCII art train. aafire displays a ASCII art fireplace at your terminal. 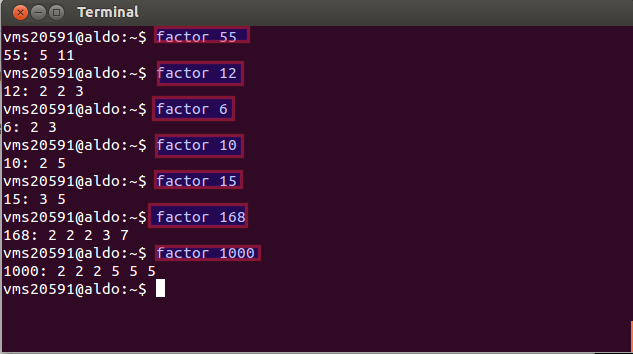 Factor is a simple command line utility with which you can get the prime factors of any number you give as input. 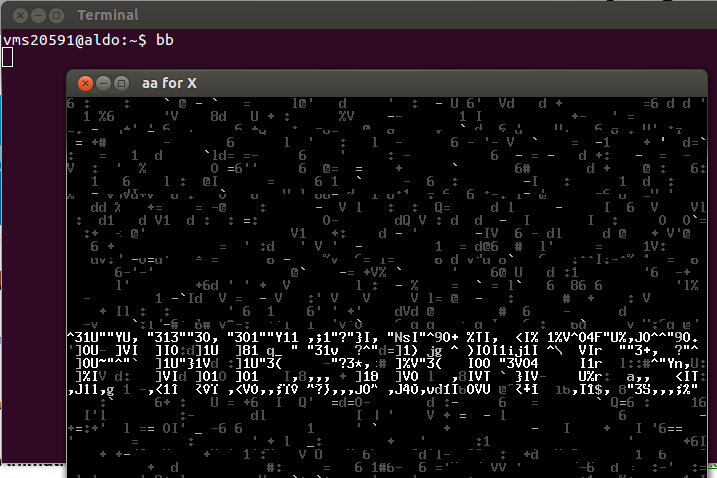 If you are ever fascinated in creating ASCII art of any text then you might want to try this command. Need nice quotes for fowarding to your friends or tweeting them ?? well fortune command can come in handy. Have you ever counted how many commands and how many times you’ve used them?? Hash command stores all that information and you can access them with single command. 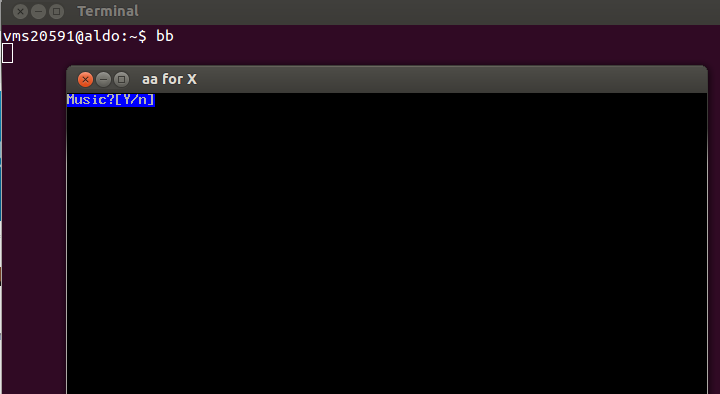 Hello is a simple command with which you can display hello text in your terminal along with your own message. You would feel bored to use the long commands which makes you so lazy to use them and you would’ve wondered if there are any alternatives. There comes the alias command for the aid. 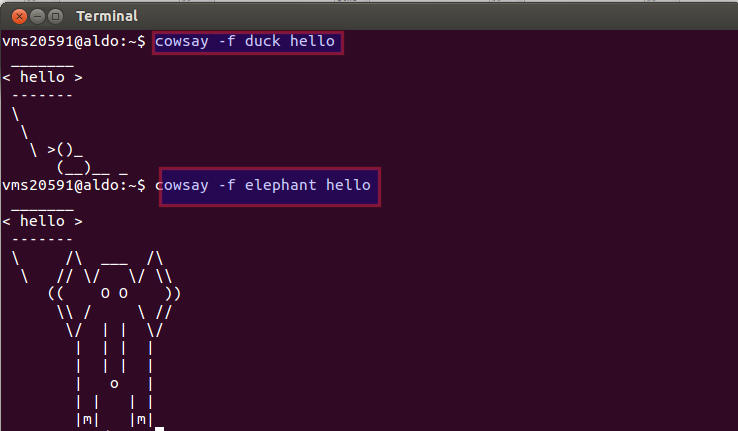 Alias is a command with which you can create aliases for your favorite commands. Rev is a simple command which reverses the text which you give as input. Then enter the text and press enter to get the reversed text. Date and cal commands displays the current date,time and the calender. 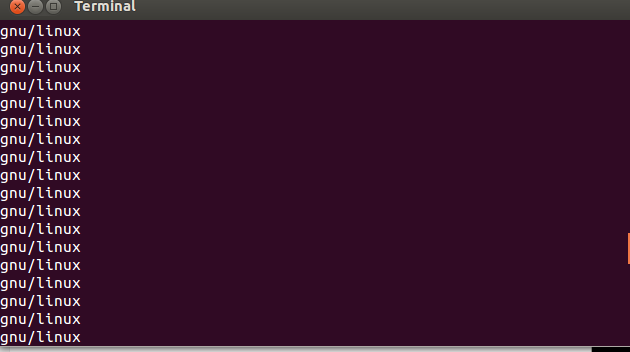 Yes is a command which displays a given text in an infinite loop. 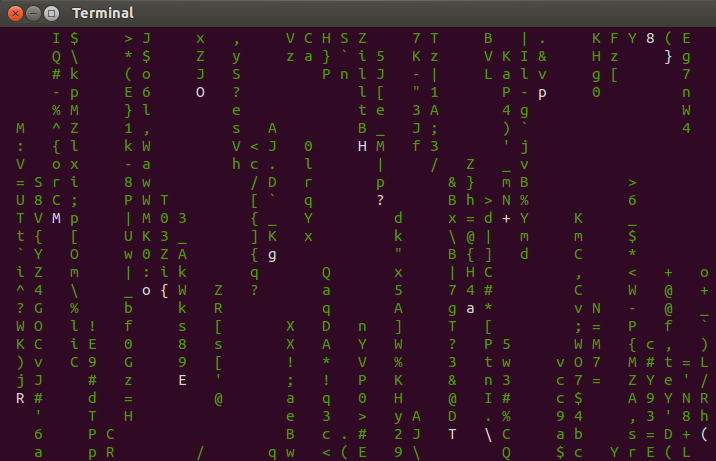 CMatrix lets you to see matrix film like screensavers in your terminal. 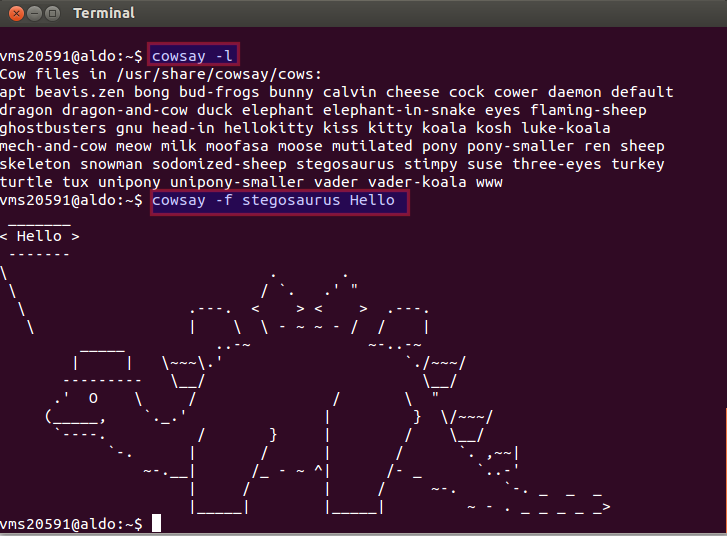 So far we have seen commands like cowsay, xcowsay, fortune, figlet, yes, factor, date&cal etc., but these commands can be combined to produce different effects. Likewise you can try out various combinations like these to see different outputs. 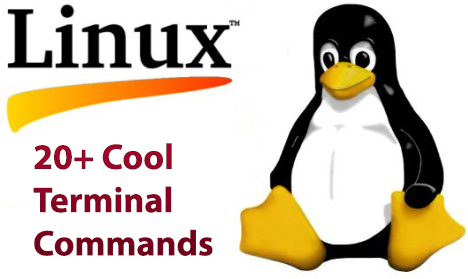 These are some of the different funny and cool commands which you can use in terminal which will be produce some really cool results while some may feel its useless. No problem if its useless and there are still cool things like these out there to have fun with. Hunt them down and have fun. Hope you find this information useful. that’s great thanks for this!